Look at these cute test tubes! Is there anything more perfect to keep your seasonings in it? No, of course not! This is so unique and awesome. These glass tubes come in sets of five. They have purple or lime silicone stoppers that will keep your herbs fresh and you will also get a wooden laboratory rack to hold them. Your kitchen will look like a chemistry lab! There are no names of the seasonings on the tubes, just labels with letters that sound little bit like the elements from the periodic table. You will get 36 easy-peel, re-usable herb and spice labels so you won’t mix up your herbs. 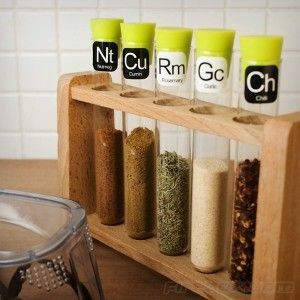 You can buy this awesome scientific spice rack at Firebox and it coasts Â£19.99. Spices are not included. You don’t have to worry that this would be too big for your kitchen. Rack measures approximately 5x23x15 cm and the test tubes are approximately 1.5 x 16 cm.